Jóhannes Sveinsson Kjarval (1885–1972) has a unique place in Icelandic cultural history, as one of the nation's most beloved artists of all time. He was a legend in his own lifetime, and in the eyes of many he was the archetypal romantic bohemian artist. 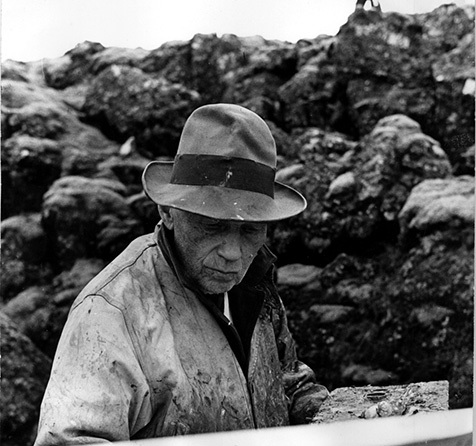 He had his roots in traditional Icelandic farming society, and his life and art were inextricably entwined with the nation's cultural renaissance in the early 20th century. He is best known for his interpretation of nature, and especially the mystical visual world manifested in his art. In Kjarval's long artistic career, his basic vision remained the same – that nature is alive – although the emphases of his work evolved and changed over the years. Kjarval donated some of his works and personal effects to the city of Reykjavík in 1968. The gift comprised mainly drawings and sketches. A part of his gift was exhibited for the first time at the opening of the Kjarvalsstaðir gallery in 1973. The collection has grown steadily over the years, both through purchases and invaluable donations from private individuals. Kjarvalsstaðir houses a permanent exhibition of Kjarval's works, which provides a general introduction to his work and artistic career. Kjarval has been justly called the master of the line. During his student years in Copenhagen, he placed great emphasis on drawing, because he always felt that this element was lacking in his training. Ever after, drawing was an integral part of his creative process. Kjarval's drawings, sketches and assorted scribbles reflect the extraordinary imaginative power and fertility of a mind in free and uninhibited expression. When inspiration struck he would sketch his ideas on whatever bit of paper was at hand – letters, envelopes, cigarette cartons, paper napkins or bank forms. He also used higher- quality drawing paper of different shapes and sizes, as well as unconventional media such as wrapping-paper or a variety of transparent papers. Reykjavík Art Museum has in its possession about 180 paintings by Kjarval, most of them painted after 1935. In 1929 Kjarval started painting in the open air, often making many works in the same location, displaying the changing impressions at different seasons, and in varying weather and light conditions. From the 1940s onwards, the foreground became increasingly important in Kjarval's landscapes, the perspective became narrower, and finally the textures and colour nuances of lava and moss became the main theme of his paintings. Despite his emphasis on landscape, Kjarval also painted portraits, abstracts and figurative works, which were usually symbolic, sometimes with a narrative twist. Kjarval's fantastical paintings are diverse, but the same symbols or leitmotivs appear over and over again in different works. In the 1940s, subjective fantasies were most prominent in his works, but from the 1950s Kjarval would increasingly personify various forces of nature and weather, such as snow, fog, winds, clouds and the Aurora Borealis (Northern Lights).